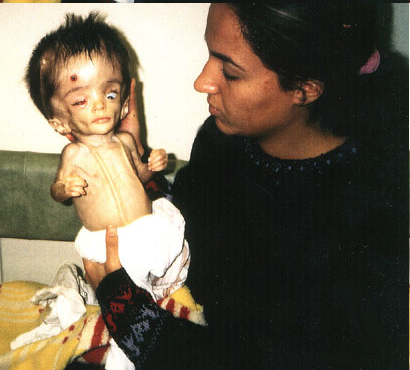 The effects of depleted uranium on a baby in Iraq. An example of Western humanitarianism. The world’s citizens were told that NATO had intervened in Libya to protect civilians, what we were not told is that the US, French and British military are dropping depleted uranium (DU) on Libyans, the poisonous toxic effects will remain with Libyans for decades to come. This is not a humanitarian intervention as the mainstream media has portrayed it, it is a humanitarian intervention from hell. According to David Wilson (Global Research: Depleted uranium: a strange way to protect Libyan civilians: March 27, 2011) in the first 24 hours of NATO’s attack on Libya, over forty-five 2,000 pound bombs with depleted uranium warheads was dropped. For those who believe that the NATO response was justified because it saved a potential massacre, the evidence reveals that the real massacre has been carried out by NATO forces with UN approval. Russian doctors in Libya have been eyewitnesses to what is happening on the ground and say that NATO and the US has deliberately targeted civilian infrastructures, including residential areas and hospitals. Andy Dilks (Global Research: Libya: Murder and Plunder Masquerading as “Humanitarian Intervention”: March 24, 2011) points to how the mainstream media is pumping out the same type of lies and propaganda about Libya as they did about Iraq and Kosovo. One brilliant example he gives of the mainstream media’s contempt for the truth is during the Kosovo war when photographs of a malnourished man behind a steel fence, no doubt to invoke strong emotions of Nazi concentration camps, was beamed worldwide by the Western media. What the public never knew was that the ITN film crew were inside a refugee camp and the man had been asked to remove his top for the photo to add affect. This treacherous and gutter journalism indicates that many mainstream journalists have no respect for the public they claim to serve, and more importantly are no different to those who turned a blind eye to the Nazis. Dilks exposes the fact the the mainstream media has failed to inform the public that the rebels have been funded for years by the very NATO powers involved in the Libya attack. This is a coup, not humanitarian intervention. He also mentions that media reports regarding Gaddafi’s alleged air force attacks on protesters have not even been verified with evidence as well as the allegations that he was using human shields to manipulate civilian casualties. The same lies upon lies, upon lies have been fed to the public to justify yet another Western war for greed. There is nothing humanitarian or even human about NATO and America’s intervention in Libya, it is that same old devil at work called colonialism. This entry was posted in International News and tagged NATO's attack on Libya, depleted uranium. Bookmark the permalink.